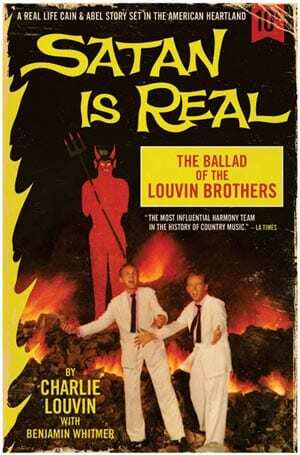 Written by Country Music Hall of Famer Charlie Louvin (before his Jan. 26, 2011 death) with author Benjamin Whitmer, Satan Is Real: The Ballad of the Louvin Brothers [Igniter Publishing], is a fascinating first-person recollection of the origin, success, and demise of one of the greatest harmony duos in musical history. The Louvin Brothers’ Capitol Records albums Tragic Songs of Life and Satan Is Real have endured to become treasured documents of traditional country, and their massive influence extends to Johnny Cash, Gram Parsons, The Everly Brothers, Emmylou Harris, Lucinda Williams and countless others. Ira and Charlie Loudermilk, born to hardscrabble farm surroundings in Sand Mountain, Alabama, honed their harmonizing skills as children through Sacred Harp church singing traditions and mastering centuries-old folk songs like “Mary of the Wild Moor.” They later added a guitar and mandolin to the mix, playing regional shows and radio spots as the Radio Twins. They adopted the Louvin Brothers stage name while in Knoxville for ease of spelling. After they had begun building a following, they event opened shows for a young Elvis Presley before realizing their lifelong dream of joining the Grand Ole Opry. But for every good time, there’s an equally dark time, and this story doesn’t end happily for everyone. Charlie narrates the book in a raw, plainspoken style, and it appears co-author Whitmer (to his credit) didn’t fuss too much with editing out the swear words or homespun vernacular. Much of the book focuses on the troubled relationship between Charlie and Ira, who was cursed with a self-destructive streak that haunted him until his death in 1965. Tales of smashed instruments, domestic disputes, and fist fights abound, playing in stark contrast to the fire and brimstone gospel that permeates their gospel work like Satan Is Real. Charlie also doesn’t mince words about how country music has changed over the last few years, what it’s like for older members of the Grand Ole Opry, or his feelings on some of his artist contemporaries. The pulp novel cover design is marvelous, featuring the unforgettable Satan Is Real album image of the brothers in pristine white suits, singing for our very souls in front of a giant burning plywood Satan. The edges have been distressed and a 10 cent badge (for looks only–retail price is $22.99) is affixed to the corner to give it the appearance of being a shelf-worn volume from the mid-20th century. Between chapters the spine is illustrated with ink flames, and the pages include photos of Charlie and Ira from all stages of their career. It’s brutally honest, even humorous on occasion, in highlighting the Louvin’s brotherly bond and the great music they created together. Highly recommended for fans of the traditional stuff or anyone looking to hear history straight from one of its makers.